Why not start off 2019 with revamping your outdoor area? Now that 2018 is behind us you can begin to envision making some new changes to your outdoor space. Starting with new patio furniture or simply giving a new fresh existence to your lived in outdoor space. Here are some good ideas for revamping your outdoor area. Start 2019 with a fresh, reorganized and rejuvenated outdoor oasis. Creating a new backyard hideaway you can escape to when the sun starts to peek through the clouds. It might me time to invest in some new patio furniture. Weather and the elements can do a number on outdoor lounge furniture. If you are looking for fresh ideas visit any Patioworld location. Our showrooms can provide you with an abundance of inspiration. Synthetic woven furniture like woven wicker is one of the great revolutionary concepts in outdoor furniture. Synthetic is a great way to withstand harsher climates. It will stay in great condition for longer periods of outdoor exposure. If you are looking for easy to care for outdoor furniture then aluminum patio furniture might be just the solution. Are you looking for patio furniture that can withstand corrosion or damage? Wrought iron furniture is a great option. Patioworld works with a German manufacturer that extensively pretreats the furniture to make sure it can stand the test of time and the hot California sun. Our showrooms are a great place to visit if you are looking for inspiration or to see if these possibilities are just what you are looking for. If you are not in the market for a brand new furniture set, but are still thinking about revamping your outdoor area think accessories. Bold statement pieces or small accent accessories are a great way to rejuvenate an outdoor area to make it feel fresh. Putting pieces you are not accustomed to seeing in your outdoor space can bring a sense of style and uniqueness. This includes new throw pillows or purchasing new cushion seating for your outdoor furniture. Adding splashes of color or indicators of your creative style can do a lot to freshen up your space. Sometimes adding fresh foliage can liven up your patio area. Climate friendly plants or herb gardens can bring an outdoor space to life. Choosing above ground planter boxes for gardening is a great way to increase time spent in your outdoor area, while providing something for your indoor kitchen. If you are lacking space making tiny gardens from wine barrels or even window planter boxes are great ways to have a green thumb and make your outdoor area have a different feel. 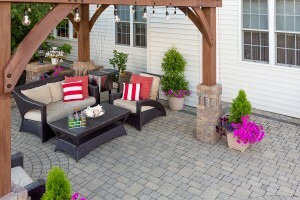 Revamping your outdoor area and bringing fresh ideas into the new year is a great motivator. Spending time to create an area that is uniquely yours will make you feel great about the new year to come.